Guardian Physical is enterprise software that centralizes the administration and management of identities within the enterprise and maintains a close relationship to organizational roles, responsibilities and how they relate to physical access. Combining the decisions to manage the amount of system access with the extent of physical area access improves security, reduces organizational risk and lowers the cost of operations for corporate and enterprise security. Enterprises today are conditioned to respond to incidents along the lines of their departmental silos. The current approach to handling enterprise security in departmental silos has failed to stem the rising tide of security breaches. Enterprise Guardian - Physical is the industry-leading Identity and Access Management solution that integrates Physical Access Control Systems and Badging with enterprise applications, HR systems and IT directory services like Active Directory and LDAP. 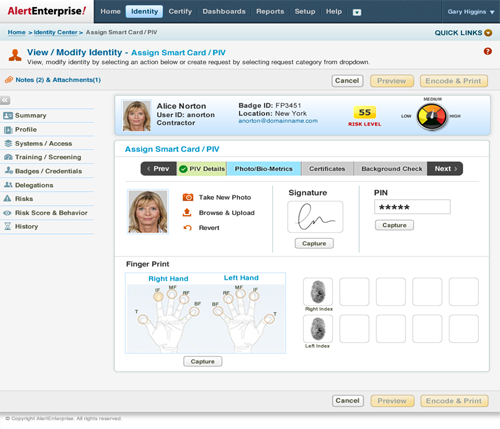 Guardian Physical™ from AlertEnterprise® delivers Physical Identity and Access Management solution that operates across badging systems from multiple vendors to deliver a common console that enforces uniform policies across all facilities, sites and locations regardless of disparate badging systems from multiple vendors. Many large enterprises, multinational corporations and government institutions operate multiple facilities that include owned buildings, leased properties and plant operations that extend across cities, states and countries. Many of these facilities operate Physical Access Control Systems that were procured over long periods of time, owned by landlords, or acquired as a result of company mergers. Guardian Physical, extends all the benefits of common identity management to scale up to a much larger context with a common operating environment. It uniquely leverage existing Access Control systems by accounting for limits on the number of users a system can support and converting native systems to completely scalable enterprise systems with common provisioning and reporting across systems from multiple vendors. AlertEnterprise has the flexibility to manage Identities and badges across multiple buildings in a local site, or extend across time zones and country borders to deliver unified operation. Deliver an authoritative common identity source that eliminates gaps between logical and physical identities. Scale the operation of Access Control Systems to meet enterprise needs across time zones and geographies. Reduce cost and reduce risk by eliminating overlap of function, extending the useful life of existing systems and enhancing overall security.